This incredible book about Apollo 11, features the most amazing pop-ups I have ever seen in my life!!! Every time I turned the page, I was oohing and aahing over the beautiful graphics and the intricacy of the pop-ups. There is a pop-up of the Apollo 11 rocket that is at least a foot long, and it blasts up from the page! As if the gorgeous pictures and pop-ups weren’t enough, the story of the moon landing is also marvelous and full of interesting details. If you can tear your eyeballs away from the exquisite photos long enough to actually read the story, it is a delightful and easy to read history of the entire moon landing journey from start to finish. 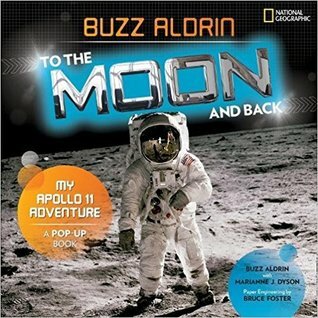 I loved how Buzz Aldrin tells the story from his own perspective! And as if the interesting story AND pictures AND pop-ups weren’t enough, there is ALSO an insert with a paper model of the Eagle lunar module complete with assembly instructions for putting it together! I’m going to give this book to my niece as a Christmas gift, and hope it inspires her to do amazing things! It sure inspired me!